The Mangosteen International Fashion Show Installation, organized by Reve Creative Community, is a one-of-a-kind modern event featuring world known contemporary designers and their innovative collections. Their main event took place on April 29, 2017 at the HACK Temple in the heart of San Francisco, hosting over 400 guests, including renowned local and international designers, industry investors, as well as over 20 media outlets. Elena Rubtsova, the founder of Reve Creative, a brand expert and fashion guru, was responsible for organizing and running the show. Expanding a brand, connecting the world. The Mangosteen Fashion Show was committed to connecting their vast international community, including countries like Singapore and Russia. Elena was looking for a reliable live streaming solution to bring a high quality, “real-time presence” video experience to all those unable to attend the real-life event. Being a brand specialist, Elena understood the importance of exposure to new audiences as well as establishing a strong web-presence in order to help build and expand her creative brand. With a high quality live video stream she was hoping to highlight the high-end nature and exclusivity of the show, while at the same time share this amazing experience with a larger audience. Reve Creative Community had done live streaming to Facebook in the past, however it did not provide the right level of functionality. Having used a smartphone for her previous live stream, Elena knew that it does not provide the desired level of quality, angles are limited to just one, and neither does it allow for streaming to more than one social media platform. It was very important for Elena to provide a high quality video and audio broadcast, offering a variety of different camera angles, allowing for capture of every detail, creating a dynamic and engaging live stream to help attract and retain viewers. She was also committed to reaching a much wider audience by live event streaming to multiple social media platforms. Elena chose Epiphan’s all-in-one recording and streaming solution, Pearl-2. Using this device, she was able to live stream a high quality production to multiple social media platforms, all while seamlessly switching between various video sources and layouts. Pearl-2 mixed six video signals in this setup: four LUMiO 12x cameras (using 2 SDI and 2 HDMI cables) and two Panasonic GH5 cameras (using HDMI cables). The LUMiO cameras were rigged up in beforehand and each configured to capture a wide shot of the room. The two Panasonic “field” cameras on tripods were constantly moving about the venue, capturing interviews, close-ups and other event details. Long cables were drawn from the cameras to a control room, where Pearl-2 was located. A wireless microphone was used to capture the event sound. It was also used by a floor reporter to get guest interviews and reactions. The mic signal was then put through an audio mixer and the clean, calibrated audio was then sent from the mixer to Pearl-2 using XLR cables. Once the show started, the production went live on YouTube and Facebook, streaming high quality video and audio to the entire world. All that Elena had to do was simply switch between the preset layouts using the simple and intuitive Epiphan Live mobile control interface. (Switching could also be done locally using the Pearl-2 touch screen interface!). Mangosteen Fashion Show’s live stream was able to provide a real-time submersion into the world of high fashion for the entire globe. Thanks to multistreaming to different platforms, Reve Creative was able to reach a new, much broader and more diverse audience. Even without a strong prior promotion, the stream was able to attract 500+ live viewers from USA, Russia, Singapore and many other countries. Just imagine what they can achieve with an extensive marketing campaign! The stream also attracted new customers, including industry investors, fashion designers and enthusiasts, who were able to see the event in real time. The high status and luxury of the event was matched and complimented by the superb video and sound quality of the stream, as well as the seamless switching of multiple camera angles, elevating the overall quality of the entire event. Mangosteen Fashion Show was able to connect and inspire hundreds of viewers all around the world, and continues to do so today with many new daily views of the recorded stream. Many new designers and investors contacted Elena, expressing interest in future events by Reve Creative. Thank you Reve Creative for sharing your experience with us! We are excited to keep working with you in the future and helping you bring even more beauty to your diverse audience! Elena Rubtsova is a conceptual leader with over 14 years of experience in product, marketing and branding in the fashion industry. Her obsession with luxury brands and vast experience lead her to found Reve Creative, a community that supports the most contemporary creative practices in fashion and design, connecting professionals and ideas in the most extravagant fashion events and installations. Mangosteen Fashion Show installation, organized by Reve Creative, is a one-of-a-kind modern event, providing top local and world known contemporary designers a first class luxury modern platform to showcase their collections, where innovative technologies set a proper backdrop for contemporary fashion environment. The objects in view immersed fashion, art, design and technology to produce highly conceptual pieces that look into the exquisite future. Epiphan Video builds some of the world’s most reliable AV communication solutions for education, healthcare, live event production, manufacturing, security and transportation. 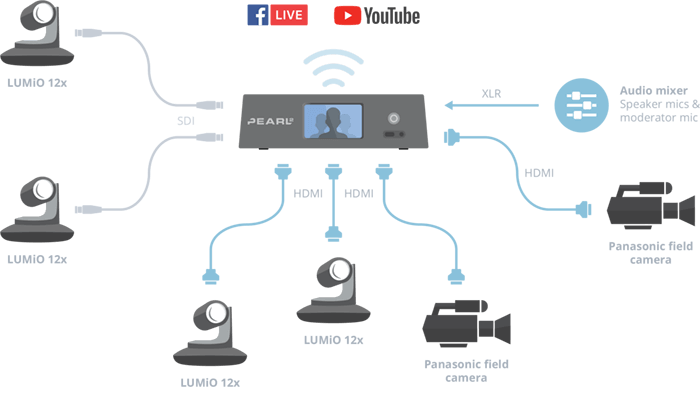 Pearl-2 is the easiest way to do 4K live streaming, switching and recording. Manage your streaming, recording and live switching in one place with this all-in-one video encoder and live video production system.